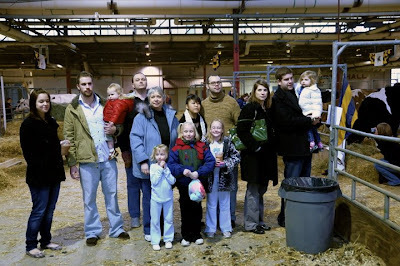 Here's the group: no one looking at the camera but pleasant mom and me, looking solemn. This is central PA's way to occupy the local farm animals and their farmers during the winter months. You can always expect horrid weather when it is Farm Show time. 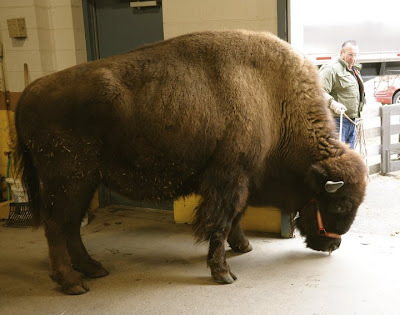 The 1,600 pound buffalo we watched leave the arena. I was starting to wonder why any of us were standing close enough to him to get this shot. Enthusiasm from the group in finally making it into the warm farm show complex after a long cold walk. This is exactly how I felt 30 minutes into the experience. This was the day of many lessons learned on my part. From cleaning the house all morning for a house showing then walking 2 hours straight at the farm show led to calling the OB Sunday about hours of progressing cramping. Thankfully, after a visit to the Doc the next day, all was well with the babies and the Mommy was reprimanded. And Johanna Cullen, I mean Shiffler, later sporting the powdered look, thanks to her sister.